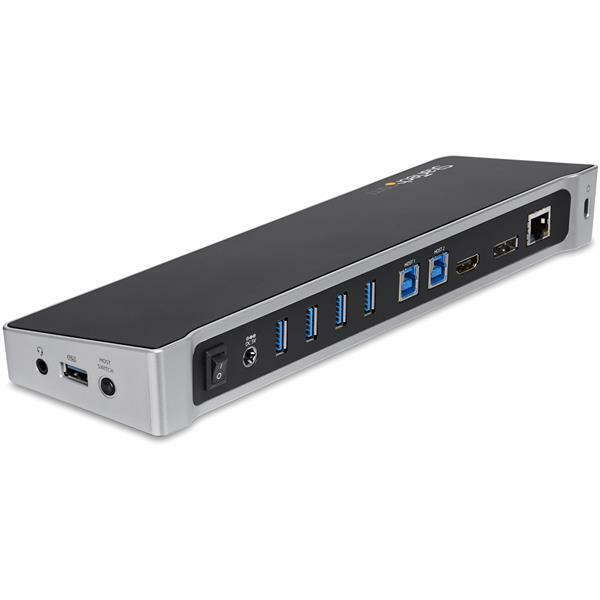 This TAA compliant KVM USB 3.0 docking station for two laptops functions like a KVM switch, enabling you to share your keyboard, video, and mouse, and transfer files between your docked laptops. 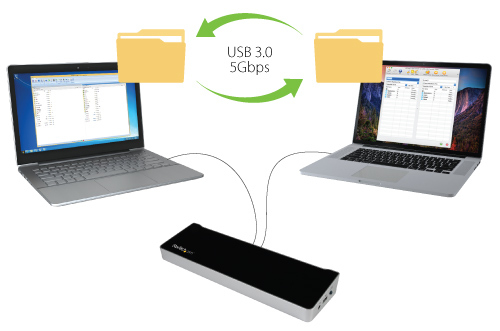 Instead of transferring files to the cloud or external storage, the docking station lets you quickly and securely transfer data between your docked laptops, using Windows Easy Transfer or the included PCLinq software. The USB 3.0 dock’s always-on USB fast-charge port lets you charge your tablets and other mobile devices, even if your laptops aren’t docked. 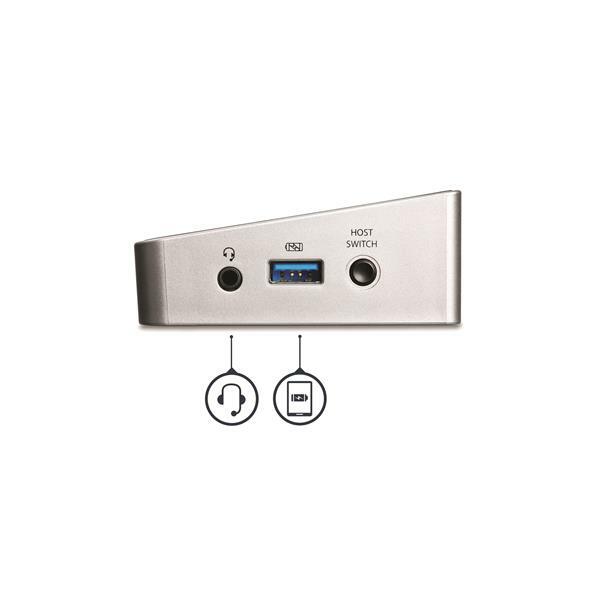 This USB docking station gives you the option to connect a single 4K display instead of dual displays. 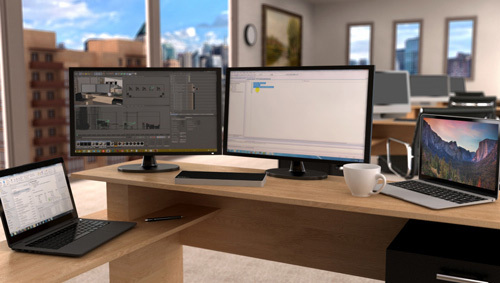 Set your laptop workstation up with dual monitors (1x DisplayPort, 1x HDMI), or for higher resolutions, connect either a single HDMI or 4K DisplayPort monitor. 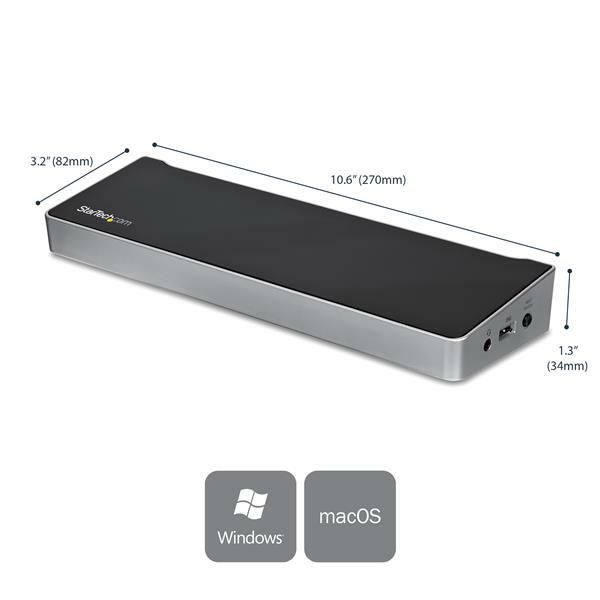 Compatible with Mac and Windows® USB 3.0 equipped laptops, the KVM docking station includes two USB 3.0 cables for quick installation and features an easy-access button for easy switching between laptops. 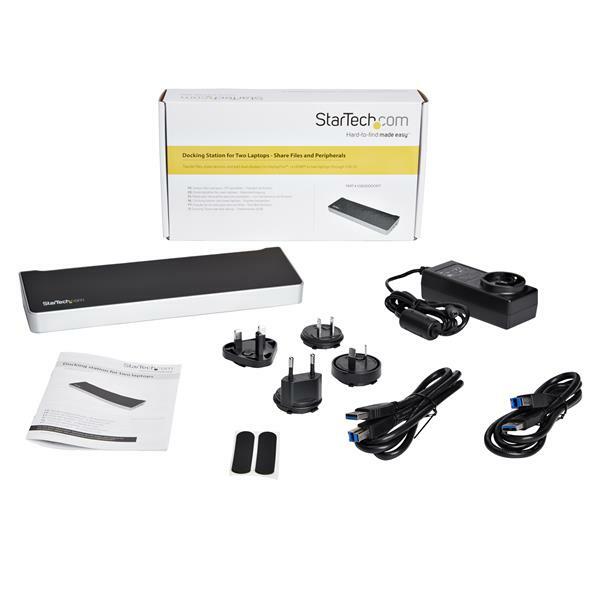 StarTech.com laptop docking stations offer cost savings and faster deployment with just a single cable. This USB 3.0 Docking Station is backed by a competitive 3-year warranty and free lifetime Technical Support. I've been using this product for almost 3 years. I allows me to switch between my company laptop and client laptop an leverage my two large monitors and peripherals for both. My company recently upgraded us to surface pros and happily the SP setup took less than 5 minutes. The only issue i've had a few times is getting my logitech usb mouse to work properly....but upgrading the mouse software seemed to do the trick. Just got this set up with two Lenovo laptops, and two Dell monitors. The video quality is fine, though I haven't tried any sort of gaming or videos. There is no perceptible lag in display or mouse function. The laptop screens run at native resolution, and each of my two monitors run at their native 1920x1600. The network driver works, as do the USB ports. Where it gets weird is when you switch from one laptop to the other. 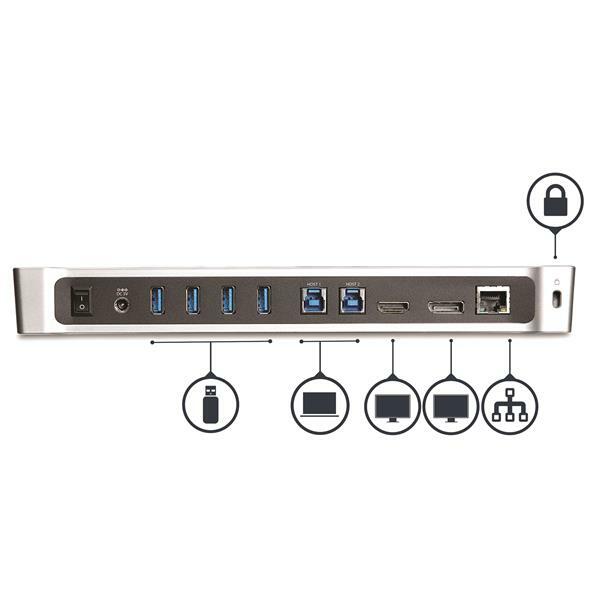 The KVM function here drops the network, USB devices, and monitor connections from the laptop that isn't being viewed. Most KVMs make all connected computers think that their peripherals are still attached, even the computer(s) that aren't selected. This one doesn't. So if you're streaming music, or doing some sort of network application when you switch away from a laptop, that stops working, as the network connection goes away. Plus, the de-selected laptop reconfigures its display setup back to its native display. 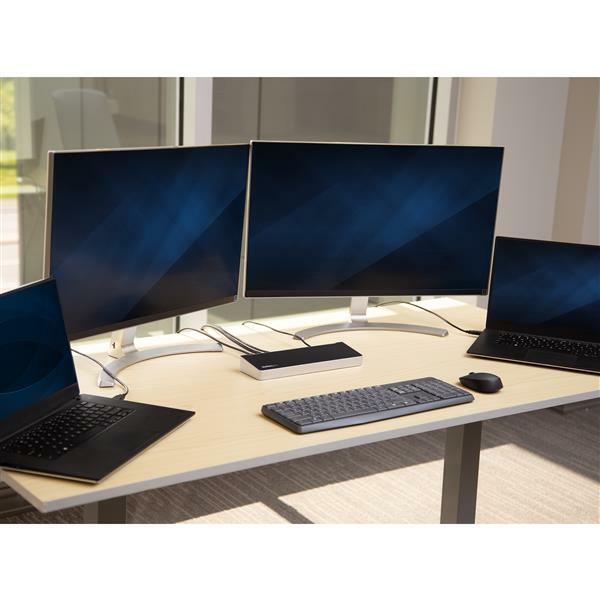 When you switch back, it again reconfigures back to multiple displays. This isn't a deal-breaker, as both laptops can use wifi, so I don't need the ethernet. That solves the dropped network problem. And the dropped monitor thing just costs a few moments while the laptops reconfigure, but this could be seen as a feature, not a bug. It's actually nice to have all apps visible on the laptop display when the other laptop is using the monitors. (5 stars) Works great on my two Dell laptops! I have a 2014 Dell XPS L702x home laptop running Windows 7 and a 2018 Dell work laptop running Windows 10. I have Bose speakers plugged into the audio jack, a USB plantronics headset, USB Microsoft Natural Keyboard Pro, USB Razer Lachesis mouse, and a 2018 32" monitor. Everything works with no issues! Have tried two different monitors and the common factor between both of them when they start turning pink or flickering is the docking station. Directly connected to the laptop and there are no issues. Connecting thru this docking station and the issue starts. Looking for something different now to replace this. So frustrating!! In rare cases, you may see flickering with monitor that support MST (Multi-Stream Transport) technology through this product. We would like to know the make and model of the monitor to double check if that is the case. We recommend bringing up the On-Screen Display Menu for the monitor and disabling MST or DP 1.2 if it was enabled. That should resolve the issue. I have this set up in my office and it works well switching between my work and home PC on my 4k TV. However, I need to disable the internal drive that contains the PCLinq software (I don't need the software) . My work sees this as an unencrypted device and blocks my access. Other than that, I am quite happy with the product. Hello Jackie, We are sorry to hear that this docking station has not been working well for you. Based on your description, it may be a defective dock. 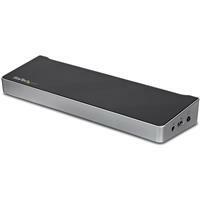 This dock does have a 3 year warranty and we would be happy to replace it if it is defective. We would like to hear more about your setup to troubleshoot the issue. You can always contact our support team 24 hours a day 5 days a week at www.startech.com/chat or 1 800 265 1844 for any product related issues. A member of our Technical Advisory team will be reaching out to you shortly by email to assist!